Is the guide service licensed, bonded, and insured in Colorado? Be aware that guides conducting “rogue trips” or persons holding themselves as guides without the proper license are not covered under the outfitters license. This practice is illegal in Colorado. What are the hidden costs of the trip? Ask if things like wader and equipment rentals are included in the trip price. Many fly shops don’t include equipment rentals, flies, tippet, leaders, and terminal tackle as part of their guide fee. Between rental equipment and fly-tackle charges, clients often find that they have an additional $80-$200 charge at the time of their trip. At Colorado Trout Hunters, waders, rods, reels, flies,and terminal tackle are always included in the trip price. Private water access fees may also apply and change depending on the property and number of anglers. Private water access fees are included in our description page for each property that we guide on. The only other thing that you are responsible for is to have a valid Colorado fishing license. (Buy fishing licence) Guide gratuity is always appreciated. Although tipping is a personal decision and the guides appreciate any and all gratuity, industry standard is approximately 20% of the total trip price. be assured that our rates are always the same as what is advertised on the RATES page of our website. What experience do the fly fishing guides have? Be aware that often, especially during peak summer months, many outfitters resort to hiring part time guides with little to no guiding experience or ski/snowboard instructors looking for summer work (just putting bodies on the water). A more recent phenomenon within the guide industry comes from the downturn in the economy. Since 2009 we are seeing a HUGE increase in the number of guides and guide services. A lot the these guides and business owners have only 1-2 years of fishing experience and very little guiding experience. 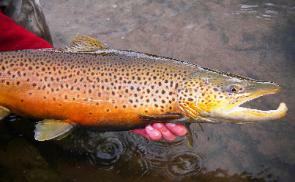 At Colorado Trout Hunters, we have well over 100 cumulative years of guiding experience. All of our guides have significant past guiding experience and fly fishing industry experience. (As of 2012 our most junior guide has been with us for 5 years and guiding professionally for 6) We have fly fishing authors, former guide service owners, long time guides and fly shop employees, as well as world traveled fly fishing experts on our staff. All of our guides are very personable and excellent instructors. We will work hard to set you up with a guide that matches your personality. Also, all of our guides have current CPR and first aide training. Why should I choose Colorado as my fly fishing destination? to many different private waters where the access in very limited ensuring that the water is not over fished. See our pictures pages! Should I choose public or private water for my fly fishing trip? the public water can be great! If this is the case we will steer you toward the public water option. Often on multi-day trips we start out on public waters to hone the anglers skill and finish up the trip on our world class private waters once you have a good handle on the basics of fly fishing. The main con of the public waters is there is potential for crowding especially on the weekends. I have a non-angling person who would like to come along watch and take pictures is this OK and is there an additional charge? It is OK to have a non-angling party along for a full or 1/2 day trip. There is no charge from us for them to come along unless they decide they would like to fish when they see how much fun it is! The situation may be different for private waters, however. In some locations, non-angling guests are often welcome, but land owners may require them to pay the access fee to be on the property. Lunch is not included for any non-angling party unless arrangements have been made ahead of time. When is the best time to come fishing in Colorado? With our wide variety of fly fishing locations, we are pleased to offer a great year-round program. Winter can be good, but the weather is most unpredictable. Spring and fall offer lots of great fly fishing opportunities and some of the best big trout fishing of the year. Summer also offers great action and can offer outstanding dry fly fishing. Whenever you can make it out, we will work hard to make sure you are into some great fly fishing! What should I bring on my Colorado fly fishing trip? Besides a fishing license and a smile please see our guide trip checklist. You are always welcome to use your own gear if you would like.